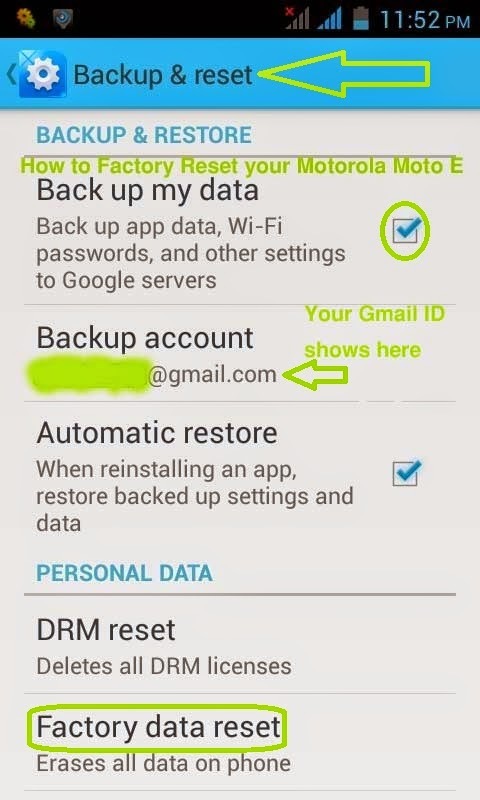 A useful guideline to perform Factory Reset your Motorola Moto E smartphone. The popularity of Motorola Moto E smartphone is increasing day by day. This phone consists of some spectacular specifications, but the price is reasonably low. This is the reason of its enormous popularity. Sometimes your phone may end up with an unknown situation then you have to factory reset your phone. For example, if you forgot the pin or password to unlock the smartphone or want to boost your phone performance, etc. However, if you have a brand new Motorola Moto E phone and set up your mind to factory reset it, then you appropriately follow this guide. N.B. Learn ‘How to Factory Reset Your Samsung Galaxy S5 phone’. Before factory reset your phone, there is something to be aware of. Factory reset function will completely erase all the content of your device including data, apps and also your phone settings. Thus you have to backup all of your necessary data, apps. You may use Android Backup Tool or other backup tools. Synchronize all of your contacts and data with Google account so that you can easily restore them after factory resetting. Of course you have to charge your phone more than 60% before starting to factory reset. It is better to charge your device during factory reset. While you will be prepared to face all the above situations, you may start to factory reset your phone. You can either factory reset your phone using phone’s hardware button or setting menu. The former becomes handy in a situation when you can’t access your phone. I will cover the both ways in this article. First, turn-off your Motorola Moto E.
Now pressing simultaneously the “Volume Down” and also “Power” buttons to enter fast boot mode. Go to “Recovery” section using your “Volume” button and then select “Recovery” option by pressing “Power” button. Select one by one ‘Wipe Data Factory Reset’ > ‘Wipe Cache Partition’ > ‘Wipe Dalvick Cache’ options respectively. Now Scrolling down to select ‘Yes’ option to ‘Confirm’ that you agree to remove all files. Whenever finished, return to ‘Main Menu’ of recovery option and select ‘Reboot System Now’ option. First, go to the ‘Setting’ option on your phone. Next, click on ‘Backup and Reset’ option. Then, select ‘Factory Data Reset Phone’ section. Finally, click on ‘Reset Phone’ and wait a random amount of time to be completed. Congratulation, you have perfectly factory reset your Motorola Moto E phone. And I also wish that your phone is now working smoothly as like as a brand new phone. If you face any kind of problem associate with this article, then let me know. You may also read the article ‘How to Factory Reset YourSamsung Galaxy S5’. Thanks a lot of for the good post. There explain how to hard reset Motorola Moto E mobile. But I have also same like a site Device hard reset There you can find more an more android Mobile hard reset solutions. This is a very informative post for all android smartphone and tablets users. Because there are know from this post how to reset android phone. I benefited from this post and I bookmark this site in my web browser's. Tnx!